Alejandro Avila was an American homicide who kidnapped, assaulted and murdered a 5 year old girl, Samantha Runnion. 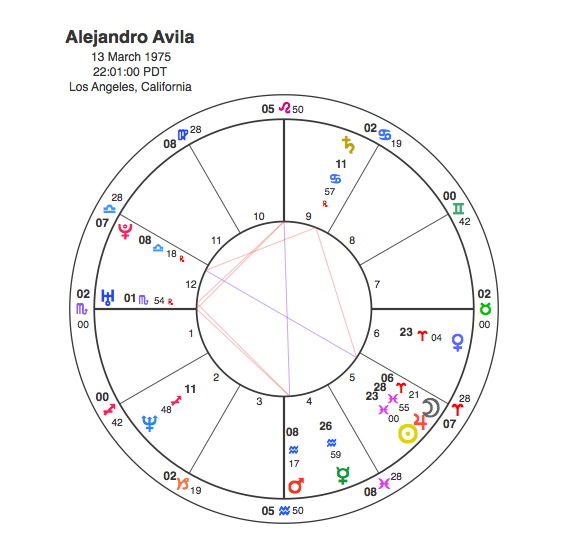 Avila had the Sun conjunct Jupiter in Pisces. The Sun in Pisces can often designate someone who is a bit of a loner, not fitting comfortably into his surroundings or with other people but this is still not what you would expect in the chart of someone who had committed such a diabolical crime. As with other notorious killers like Peter Sutcliffe its invariably not the Sun that counts in these cases but the Moon. Astrology is usually very simple, the Sun is the daytime and the light, the Moon is nighttime and the dark. The Moon rules our unconscious reactions, emotions and instincts. The Moon also has a connection with youths and children so the first place to look in the chart of a child killer would be the Moon. Avila had the Moon in Aries, a placing of someone very keen to express and act out its feelings and instincts. Scorpio is rising which adds a level of intensity to these emotions. The Moon is in the 5th house of children as is the Sun. This combination of Sun, Moon and Ascendant could point to someone with obsessions around children. If an astrologer was looking at murder, the expectation is that Pluto and Saturn and perhaps Uranus would be very strong. Uranus is exactly on the Scorpio Ascendant, indicating that a sudden, unpredictable event would dominate Avila’s life. Saturn and Pluto are extremely powerful astrological energies. They both make very strong demands on people in terms of personal growth, Saturn through hardship, frustration and depression, Pluto through powerful and explosive changes in life’s events. Unfortunately not everyone is able to respond to Saturn’s demands for strong self discipline to overcome problems or to Pluto’s insistence on a complete personal regeneration. Some people are only able to express the negative sides of these two planets. Avila has a T Square from an opposition between the Moon and Pluto which focuses onto Saturn. Scorpio rising with the Moon opposite Pluto would indicate extremely strong passions and it would be very easy for Avila to become overwhelmed by the most negative of emotions. With Saturn as the apex planet there would be a ruthlessness and a strong desire to impose control over others possibly to compensate for inner inadequacies. Saturn’s placing as the apex of a T Square in Cancer ( the sign of the family ) is a symbol that could translate as the emotional problems of the Moon / Pluto opposition being focused onto a ruthless and horrible killing of a child. The Saturn Return is something that happens to everyone in their late 20s, many people resent it because it asks for them to settle down and narrow their focus onto the essential things in life. Almost all of us take on extra responsibilities at this stage of our life and the Saturn Return is the symbol of the final sacrifice of our more carefree youthful days to take on these commitments. The Return, however, is experienced in different ways by everyone because it largely depends on Saturn’s position in the chart. When Saturn returns it reinforces what it symbolises in the birth chart. Alejandro Avila had his Saturn return in 2002, as its in the T Square it was also square his Sun and Pluto in that year. Avila kidnapped and murdered Samantha Runnion in 2002. Not to be outdone, Pluto made its only aspect to Avila’s Sun in 2004 – 5. Avila was sentenced to death in 2005. As anyone who has read these pages will know, Pluto has an extremely powerful impact on the lives of us all, often for good but sometimes for great evil. When Saturn and Pluto gang up together, however, the repercussions can indeed be horrendous.